During our spring seed shopping outing, we stumbled upon a Venus flytrap at the local nursery. Our son was immediately captivated and we began a new adventure in gardening. 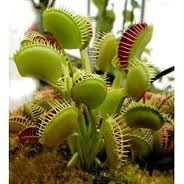 Plants that prey on animals are called carnivorous (meat-eating) plants. They are not only nature's great oddity, they are unique in their nutrient-gathering abilities for survival. Learning about them and keeping them in our home is becoming a great science project for the whole family. ﻿﻿﻿﻿ There are fifteen groups of these fascinating plants in existence with 500 species of plants within these groups. The plants we are learning about include Venus flytraps, bladderworts, sundews, butterworts, pitcher plants and the cobra lilly My son is most fascinated with the different ways in which each plant traps its pray. The Cobra Lily is of particular interest to him because of its clear cells on top of its pitcher-like trap. These cells work like little skylights. When its prey sees the spots it thinks there is a way out, when it tries to escape by flying to the light it crashes into the plants wall, falls into the water-filled trap. 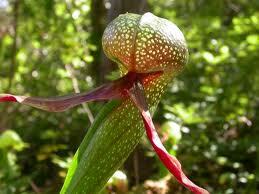 The Croatan National Forest in North Carolina has the widest selection of Carnivorous plants in one area. Once you learn about these exotic plants you will start to see them in many different places. We just attended the Boston Flower and Garden Show and saw pitcher plants in a beautiful container arrangement. There are many resources available to help in learning about theses captivating plants. We purchased our first Venus flytrap from our local nursery and then ordered different species from The Carnivorous Plant Nursery. When involving children in the care of carnivorous plants we found useful information on the New England Carnivorous Plant Society Website under Youngsters Guide to Carnivorous Plants. Growing these wonderful plants is a fun hobby as there are so many varied species. They are a beautiful addition inside and outside the home. Enjoy! I just found this blog. Have you been to the Ponkapoag Bog boardwalk in the Blue Hills? There are sundews and pitcher plants there. Very cool place to visit. I have to go out with my kids today, but I look forward to reading your blogs later tonight! Check out Dedham Natural Wonders on facebook for a local nature program that I am starting. Thanks Steph! I have not been out to Ponkapoag Bog boardwalk but will be sure to check it out! Thanks for suggesting it. I also learned there are pitcher plants at Garden in the Woods in Framingham. Look forward to checking out your nature program!